Ask fellow campers about "Renfro Valley RV Park" and nearby attractions. Campground divided into two parts with the newer portion having pull- thru 30/50 amp full hookup (including cable) sites. Restrooms are in the older area and are outdated, dirty and may not even function properly. There are no restrooms in the new area. The laundry is locked and all the machines are disconnected and sitting in the middle of the room. At one time the Entertainment Center housed an old barn for country music aficionados and the 'Barn Dance' was the third longest-running country music radio show, nearly as popular as the Grand Old Opry. There is a new barn that houses occasional shows. While we were there, Chubby Checker gave a concert (we did not attend, it was sold out). Many of their concerts are sold out. There is a village housing many little shops (most of which are closed now) surrounding the Barn. It must have been a great place to visit when in its heyday. Not a bad place for an overnight and for show-goers. Good place to stay if you want to go to a concert. Little shopping, few restaurants nearby. Farmer's Market in Mount Vernon on Saturday morning. Would not return. We camped at Renfro Valley RV Park in a Fifth Wheel. I am describing the old park. The new part is adjacent but we thought, when driving in, that it was part of the KOA so we ended up in the old part which is all 30 amp. We had our adaptor so were OK. Lots of shade available if you don't mind backing in to sites along the creek. We ended up in a pull through. (You can pick your own site early in the week - we arrived on Sunday about 5 pm so the park mostly empty in the old part.) The office is across the street and wasn't officially open with no one to talk to when we arrived so we just picked a site. The manager was driving around the park shortly after and he said we could stay so we set up and then he opened the office and registered us. The site was just barely long enough for our RV but the manager allowed us to use the adjacent site for parking our truck. Very good rates for PA Sunday thru Wednesday night. Those 4 nights cost less than the sum of Thursday and Friday nights combined! The rate I posted was an average of the amount we paid. The bathrooms were very old and badly in need of updating. They just didn't look clean to me but my husband thought they were fine...I avoided them. No laundry facilities - the washing machines were removed and laundry room locked. The park is very scenic and quiet in spite of proximity to I-75. Again, had we known of the new part (it was not explained when I made reservations even though I called twice), we would have known to stay in the new part. Overall a good place to stay Sunday thru Wednesday nights! We camped at Renfro Valley RV Park in a Fifth Wheel. The rv park left a lot to be desired. There was no onsite management or security of any kind. You're basically in a field near a tourist attraction. It is as close as we could find to Berea, which is a great town to visit, but next time I think we'll look for an alternative. We camped at Renfro Valley RV Park in a Motorhome. Great place to stay. Big, level sites. Unlike most places, the WiFi actually works. And, 60+ channels of good cable tv. Easy access to I-75 but not so close that you hear it. We've stayed here before and will again. We camped at Renfro Valley RV Park in a Motorhome. As most have already stated it is a bare bones type of park. No bathroom facilities on the creek side. I don't know if there is on the other side. Right off the highway quick, friendly and accommodating check in. Sites are nice and long with enough room in between sites as well. Services situated at the centre of each site and all working well. WiFi worked very well where we were. The campground is a nice stop for a night or two and probably a great place to be for their concerts. There is no place to get groceries or anything like that very close to the campground. A lot of area to walk pets. We would definitely return and stay here again. We camped at Renfro Valley RV Park in a Fifth Wheel. Small truck stop near Interstate convenient for fuelling up. This is our stopover when we are in this area. We haven't been through in about 18 months, but nothing has changed. This campground is great for late night easy check in. The roads are easy to navigate and we have always had a pull through site. The bath house was locked this time and I don't remember it being closed before. Power, water and sewer were all in good condition and easily accessible. This is a no frills campground that is located right off the interstate 75, but far enough away so no road noise. We like the old side behind the show barn better than the area across the creek. Make sure you call ahead to see if they are having a show. We camped at Renfro Valley RV Park in a Motorhome. The Kentucky Music hall of Fame is close by on the same road. The village area has some nice Shops and the shows in the music barns are fantastic. We stay here frequently when traveling I75. It is a very basic park, but we come for the shows at the Barn. Check their schedule, they have big names during the summer and at Christmas, but also usually have a show every weekend and it varies. 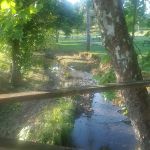 We camped at Renfro Valley RV Park in a Motorhome. Just up the road near the gas station is the Silver Eagle Dance Barn. It's a family friendly place with only soda and coffee. They also have burgers and wings. Good music, big dance floor, friendly people. It would be perfect except smoking is allowed. And take a drive up to the Berea Visitor Center. All handmade items by local artisans. They always have lots of beautiful things. Stopped here while traveling south on I-75. Perfect place for an over night stay. The Passport America rate of $17.50 made it an easy choice. It is only about 1/2 mile from I-75 but there wasn't much road nose at all. Cable TV, and water pressure were very good. True - this is a bare bones location, but easy in and out makes it worthwhile. We would stay here again when traveling I-75. We camped at Renfro Valley RV Park in a Motorhome. This is a basic bare bones campground. It is ok for a one night stay. As others stated the check in is across the street. The spots are level. It had rained a lot and all spots seemed to be ankle deep in water. We were able to hook up to water and electric but the sewer hook up was under water. Not a problem, we only stayed for the night. We camped at Renfro Valley RV Park in a Motorhome. Nice large spots. Full hookups, cable and wifi. Restrooms are old and not well maintained or regularly cleaned. Needs some TLC. We camped at Renfro Valley RV Park in a Fifth Wheel. It was a bit confusing on where to check-in. The campground is on your right as you are coming down the road from I-75, we drove through, and there was no place to check-in, we pulled out and noticed another sign on the right, telling you that check-in was on the left side of the road at the ticket office. Once we checked-in, (and they do not carry change, if you use cash!) we drove back out to the campground. A small park, with long pull through gravel sites and roads. Site was level, good hook ups, and all worked as expected. Some sites are shorter than others, but we fit without having to unhook the toad. Interior roads are a bit narrow, but easy to navigate. WiFi worked great. This is a beautiful area and will be back to explore another time! We camped at Renfro Valley RV Park in a Motorhome. Check out their website for upcoming shows. The entertainment center is an easy walk from the campground. 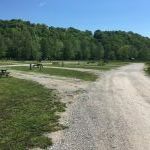 The campground is very easy access from I-75 as it is right off the highway with good roads. Internal roads and sites are gravel and were a bit dusty as it had been quite dry when we were there and campground and sites were easy to navigate. We drive a 45ft MH with a tow and were able to navigate the park and site without difficulty. As previously noted, the campground is across the road from the ticket office where one registers. 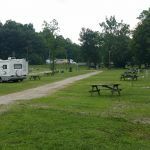 There is a section of the campground for seasonal rentals and another section for overnight stays. There are three different lengths of sites in this section with several being 100 ft. Utilities and sewer hook-up were good and site was level. No amenities to speak of but an easy overnight stop. Wifi worked fine for email and internet surfing. We would stay here again. We camped at Renfro Valley RV Park in a Motorhome. Although this is just an open field type park, the spaces are wide and gravel. The Internet, water, power, and sewer work fine and it is easy to get in and out of. There are lots of shows and museums in the area. We camped at Renfro Valley RV Park in a Motorhome. Berea, about 15 miles up the highway, is well worth a visit. We do recommend Back Porch Smokehouse at 1797 Lake Lindville Drive if you like decent BBQ and the Southern sides that go with it. Marcella's Restaurant, the BBQ joint out the back road around the lake from the check-in office, and the El Cazador Mexican restaurant are highly rated on Trip Advisor for Mt Vernon. I found none of them to be worth their ratings for either service or food quality. If you enjoy riding/driving on country roads, it seems the more digits in a route number the better (3 or 4 numbers in the route number), though Rt 70 and Rt 25 were not bad rides. Renfro Valley shows almost always excellent. Small tourist shopping area on the grounds. KY music hall of fame nearby. Several fast food and a few sit down restaurants within a mile or so. Reconstructed pioneer village on the grounds. 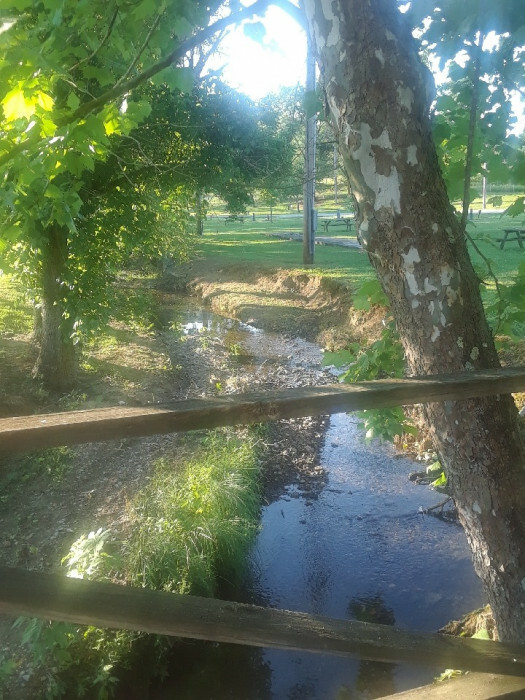 There's a footbridge over a small creek that access the large Renfro Valley entertainment center. I took a bike ride through the historic buildings but nothing was open at the time. I'm thinking when there is a concert, that's when everything is up and running. We were there midweek. Marty Stuart was appearing that Saturday night. Office is located across the street at the small motel office. Find a space first then go to office to check in. Staff very friendly. 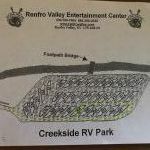 Campground sections are located on both sides of the Renfro Valley Music Hall. We stayed here during the week and there wasn't any crowd. Weekends may be different if there is a show scheduled. We would stay here again. Benfro Valley is unique, lots of country music here, the Big Barn in the complex has tons of Country stars scheduled to play here. If in the Lexington are check it out. Are you affiliated with Renfro Valley RV Park ?